I have mentioned once or twice that I have a love/hate relationship with Planetary Interaction. More specifically, I love theorizing about PI and figuring out “optimum” setups, but I hate actually bringing up my planets and refreshing extractors and moving heads and hauling goods to market and selling them. From the time I extract something to the time I sell it could easily be 3-4 months. My lowsec planets were all set up to manufacture P2 goods with 3 day cycles of extraction. But I haven’t exported goods for about 3 months and it has been several weeks since I ran my extractors. Everything has just been sitting there. When I ran everything regularly, I think I made about 300M ISK per month on 5 planets. Not bad, not great. With my new mobility and lack of regular base, I have been looking for a new PI plan. This new plan is not necessarily more profitable for the work. It is short term and mixes well with my exploration and mobile playstyle. It basically revolves around setting up planets every so often (or returning to already set up planets) to manufacture goods specifically for making Ascendancy implants for BPC’s that I find at Ghost Sites. Right now, I have 1 HG-Delta, 2 MG-Deltas, 3 MG-Epsilons, and 1 MG-Gamma BPC. I have about 300 Shattered Villard Wheels (should be just enough). The value of these components is about 350M ISk. To manufacture all of the above implants, I need about 150,000,000 P0 products (spread unevenly across 11 commodities). If I run 5 planets extracting and converting an average of 4000 units per hour, then I can complete this in a month. The idea is to use my main to run the extraction and P1 conversion and use my low skill alt to have 2 planets with P1->P3 conversion. The value of the 7 manufactured implants is approximately 1B ISK. The final size is only 7m3 so it can be transported in anything (no hauler or Epithal runs required). After I take out my setup and manufacturing costs my PI setup should make about 600-650M isk in 1 month. So I set up my planets (needed about 1 hour of training on my alt) and got them started on 23 hour cycles. I am not sure I can keep up daily cycles for a month, but I am averaging about 5500 units per hour extraction so I have some fluff. About half of the 150M P0 units required are Micro Organisms, Aqueous Liquids, and Carbon Compounds which are fairly easy to find. The only tricky part is finding the right combination of planets to get an even distribution of extraction of the 11 different commodities. Since I will have to extract 2-3 different materials from some planets, I will have to move my extraction/factories to different locations to make the most of the hotspots. This will help me to keep from exhausting materials from the planet and keep my overall extraction rates high though. Anyway, I had fun setting up the spreadsheets and I enjoy manufacturing the BPC’s that I find out in space. The ISK gain is really secondary. And it gives me something to do that doesn’t require longer or uninterrupted sessions. The downside is that it ties me to 1 area for 30 days, but with the LS-LS wormholes about I can frequently go to a new area and still come back in the same session should I decide I want to do some exploration. The other upside is that this is temporary. I can leave it set up and come back to it when I have more BPC’s – or I can completely shut it down and start up new planets somewhere else if desired. I was kind of looking for the “perfect setup” that I would keep returning to, but after not finding it (and getting tired of looking), I settled on “good enough”. This entry was posted in EVE, Industry and tagged ghost site, Planetary Interaction on September 11, 2014 12:12 pm by Pilgrim in Exile. Follow-up to the previous post. I picked can#2. The Tech2 implants were low-grade so I was betting they weren’t worth a ton, and I knew the tractor beam module BPC was pretty new so it had some possibilities. Normally, I can hack at least 2 cans at a Ghost Site so I was hoping for both. Then the 3 pilots showed up on local. One of them, I recognized as passing through the system just a couple of minutes ago and the other 2 pilots were in the same corp. Did he see the Ghost Site and change ships and/or come back with friends? The Ghost site is out of d-scan range of both gates so they can’t scan me immediately. I continue to refresh d-scan constantly while working my way through the minigame. A Legion and Proteus show up on d-scan. Time to bail? I set my orbit to 1000m around the can hoping to slingshot away. 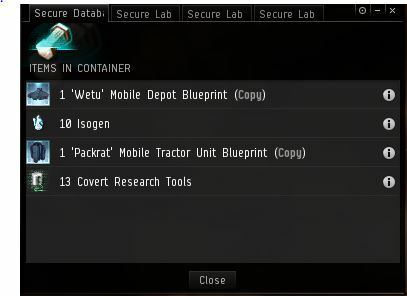 I finish the hack and collect the loot (Wetu BPC, Packrat BPC, Covert Research Tools). I would really like that other can, but the combination of a Legion and Proteus can take me out pretty easily if they are set up for it. Still, I think about going for it when suddenly, my engagement flag is activated and I am surrounded by rats. About 5 seconds later the remaining cans blow up dealing a hefty chunk of explosive damage, and I am warp-disrupted. Fortunately, I was out of range of the cans when they blew so I am only taking rat damage. I am aligned to a bookmark and speeding away under MWD. Just in case the Proteus and Legion land, I want to be as far away from the warp-in as possible. Finally, rats despawn and I warp away safely. The Proteus and Legion are still in the system and not at either gate. I don’t know what they are doing (maybe they came in from a wormhole? ), but at least they didn’t come straight to me. I cloak up and leave the system. As part of my post-op review, I evaluate my decisions and my execution. In this case, things turned out ok, but I was taking a fair bit of risk for an unknown reward. The Epilson BPC was worth about 40-50M. The Gamma BPC was worth about 5-10M. The can I chose had the Wetu BPC worth about 5-10M and the Packrat BPC. That one is still too new to have an established price. 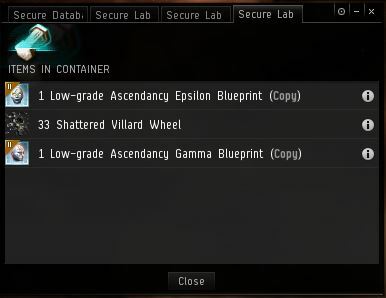 The mobile structure isn’t even in eve-central yet. But I was risking a billion isk ship. The question was, how big was the risk? The two Tech-3’s plus whatever the 3rd ship was could have taken me pretty easily. But they had to act quickly and in conjunction. I was counting at their hesitation. Eventually, that is going to get me killed, but since this is only a game – that is half the fun! This entry was posted in EVE, Exploration and tagged ghost site, lowsec on April 10, 2014 2:35 pm by Pilgrim in Exile. (1) Which one do you choose first? You arrive at the first can and just as you start hacking it, 3 pilots show up in the system. They are all in the same corp. You recognize one of them as having just passed through the system 2 minutes ago. (2) Do you finish hacking or warp out? This entry was posted in EVE, Exploration and tagged ghost site, lowsec on April 9, 2014 11:54 pm by Pilgrim in Exile. Comments: It has been awhile since I posted a log. 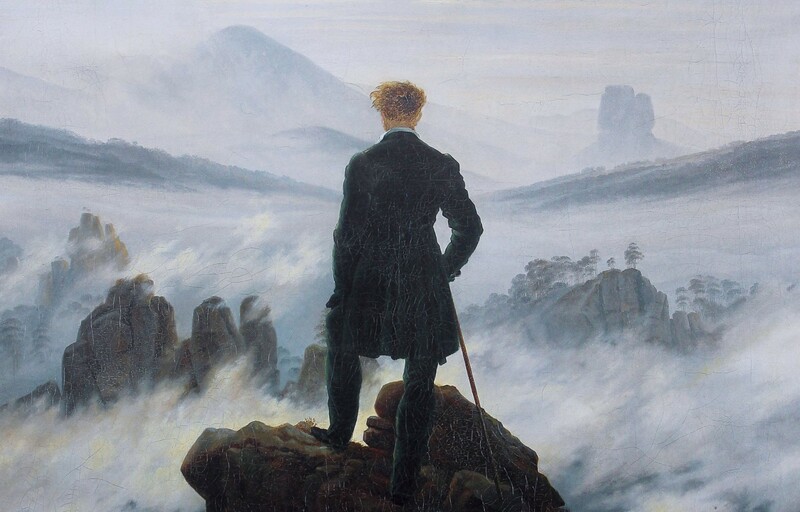 Mostly because I have been doing more wandering than exploring. I have been casually chasing Ghost sites, but since I hadn’t been keeping track of my loot or my play time, it was hard to make an accurate log about it. My current area of Angels Nullsec is quite active. Kudos to the locals for actually occupying their (contested) system. I even got to run a gate camp with a bubble and about 6 ships (Loki, Sabre, 2-3 Interceptors, Ishtar, a couple of others). I am pretty sure they set it up just for me since I went down a pipe on a dead-end chain. It wasn’t there on my way in, but it was there on my way out. Tengu’s are quite slippery though and they did not get a lock on me. I decided to give them some space and went a few more systems over before scanning. I found a data site with a faction BPC worth about 25M isk. I picked that up and skipped the rest. It isn’t so much that data sites are bad for Isk/hour as much as they are bad for Isk/m3. Since I will be out awhile (probably), I need to watch my inventory space. I found a couple of relic sites and picked them clean for another 50M isk. A couple of systems over, I came across another scanner. His alliance held sov a couple of systems away so he was semi-local. I moved on to the next system. I found a low-strength relic site and had just resolved the signal when the scanner showed up. I recalled my probes and waited to see what he would do. He waited also. I warped back to the previous system to see what he had skipped. I found a WH and a few combat sites. That meant he was probably doing profession sites. I refit to add a scram/disruptor and a sensor booster and went back to the relic system. Maybe I could catch a Cov Ops with a hull full of loot? Nope, he stayed cloaked the whole time. I warped back to the previous system to check out the wormhole. There were towers on scan, but no ships. I poked around a bit before I noticed a Ghost site on the scanner! I made a mistake though: I warped to it immediately – completely forgetting that I had unfit my hacking modules. By the time I could launch a depot and get them refitted, the site despawned. Oh well. I poked around the other wormholes and went into a couple different areas of drone space. Nothing to see. I went back to my originating system to see if the scanner was still there. He wasn’t. I warped to the relic site and it was untouched. It was a nice one, too. I pulled in about 75M of loot out of it. This entry was posted in Exploration Log and tagged Exploration, ghost site, nullsec, relic sites on January 3, 2014 5:40 am by Pilgrim in Exile.